SHAWN: James Walls has written a guest post about the kinds of miniatures he uses while gaming with the kids. Check out his mini bio at the bottom too. There is a gallery at the bottom that I added a couple of my own LEGO shots too. When Dungeons & Dragons 3rd Edition crashed onto the gaming scene in the summer of 2000, I, like many other AD&D 2nd Edition players, was at a severe disadvantage. After years of playing a game well-suited for “theater of the mind” style combat, D&D 3E’s rules were geared towards miniatures play, and my collection at the time was quite meager. All I had was a dozen Ral Partha pewters (mostly dwarves), a half-painted Mordheim collection (mostly Skaven), and the Hero Quest board game. Maybe it was just the groups I played with, but I received a fair share of complaints from my players for this puny collection. “Green orcs? Again?” was a common moan at my table. When Wizards of the Coast finally released pre-painted plastic miniatures I spent at least two-hundred dollars snatching up randomly assorted boxes for both Dungeons & Dragons and Star Wars. Eventually I drifted away from my miniatures collection when I switched from Dungeons & Dragons to Savage Worlds. Indeed my D&D figures didn’t fit the steampunk campaign I was running, but more importantly I had shifted to becoming an online gamer. Maptool worked just fine for most of my games and I thought I was completely finished with miniatures in role-playing games. Until I turned my kids into gamers! In early 2014 our family jumped head first into a Disney themed Numenera campaign. In the Cypher System, miniatures combat is not necessary, however my daughters had an easier time following along if I used a dry-erase battle-mat and minis. But we weren’t using traditional RPG miniatures for our gameplay. We actually started digging into toy boxes and craft bins for just the right creature or character. 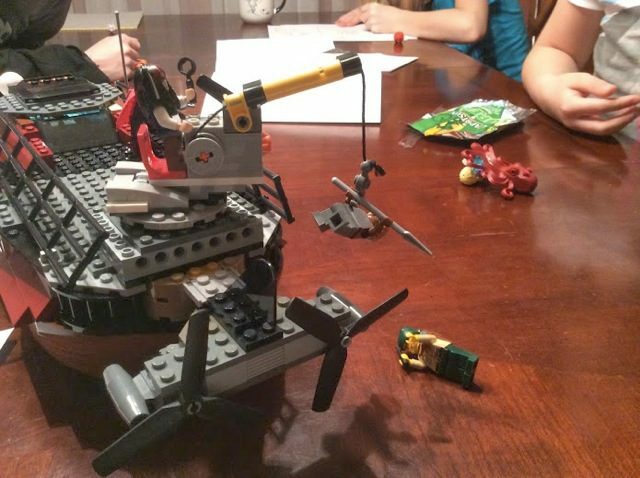 I soon came to the realization that playing RPGs with Legos, Play Doh, and action figures was far more fun for our family than breaking out those boring old Mordheim or Hero Quest relics. If you are both a gamer and a parent, you may not realize this but your kids are sitting on a treasure trove of table-ready miniatures just waiting to be brought out during a family game night. Allow me to make a few suggestions as to what has worked well in our games. This is pretty obvious, and I am certainly not the first RPG aficionado to feature Legos at the game table. Just do a search on Google Images and you’ll find hundreds of pictures of other gamers showing off the Lego versions of their characters. It is easy to see why! My players used to spend fifteen or twenty minutes digging through my miniatures case when it was time to select a new character, only to be disappointed with their final selection. But with Legos, not only can you create an entirely customized character in minutes; you can make changes to them during their adventuring careers! Also, you can prepare Lego mini-figures for a wider variety of genres, at a much cheaper cost! Sci-fi, Westerns, Star Wars, Modern – they make Legos for just about anything nowadays. Compared to other toys Legos may not be cheap, but they are far less expensive than what you’d find in a game store. Eat your heart out, Warhammer 40K players! 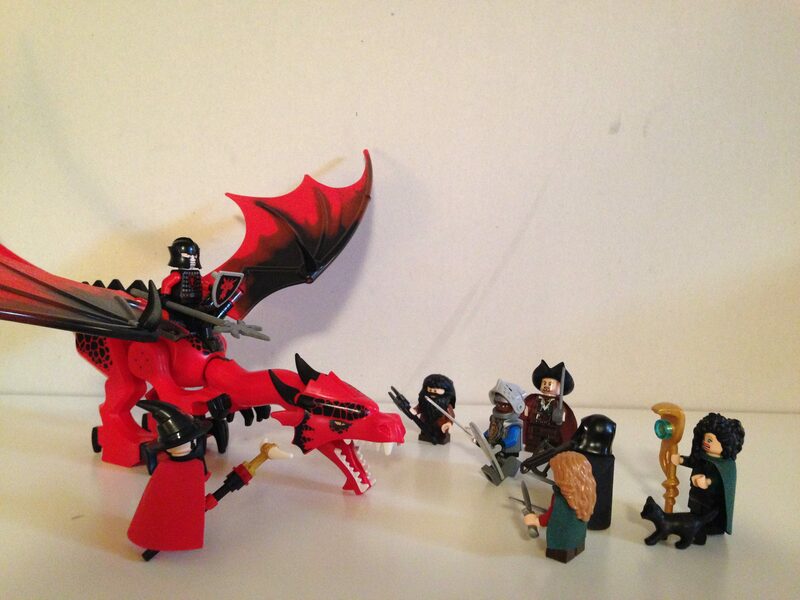 Maybe Lego RPG minis aren’t just for kids? 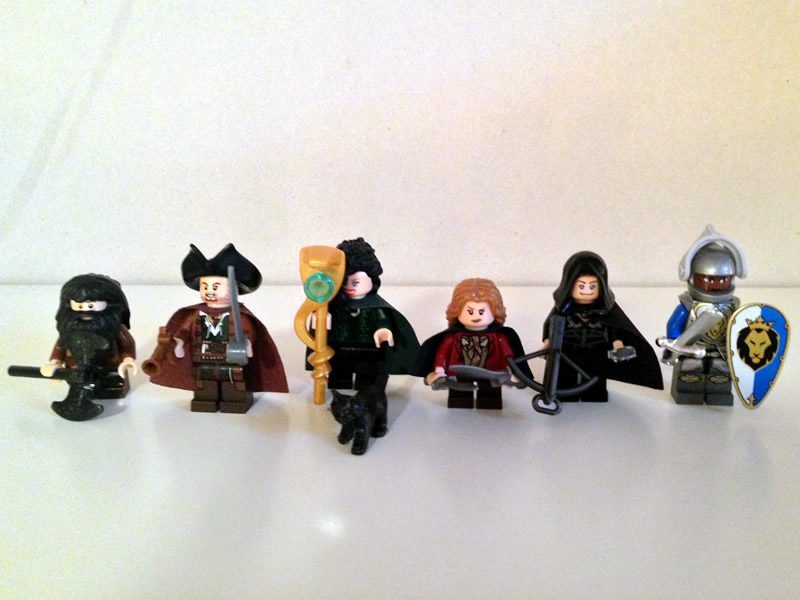 2015 is an especially great year to purchase Legos for your fantasy games since The Hobbit Lego line is still featured at most retailers. Elves, wizards, dwarves, the Hobbit Lego series has everything you need for a great fantasy game but get them while you can. That’s my only real advice for becoming an avid Lego tabletop gamer: if you like a particular genre, buy it while it’s still on the shelves. Nothing is worse than having to scour eBay because you missed out on something awesome for your table. Believe me, as a rampant fan of the Monster Fighter series, I wish I completed our family’s set. I still don’t have the Werewolf minifigure, and it haunts me whenever we play Savage Worlds – Accursed! 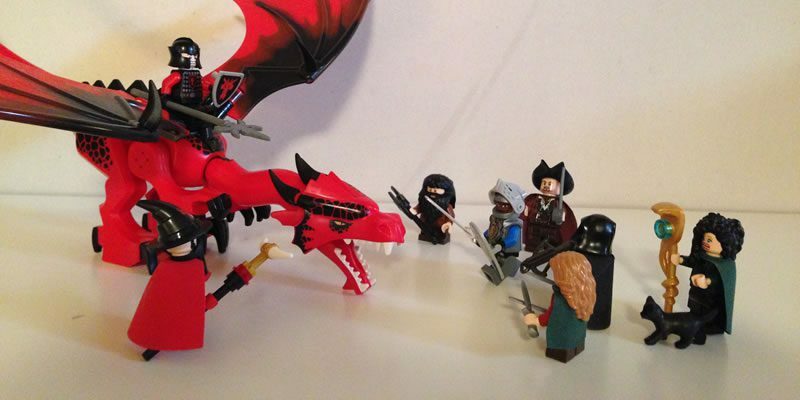 So you’ve got your entire adventuring party full of Lego mini-figures, and now you need some monsters. Actually, you’ll be able to acquire a few dark denizens in the Lego universe, but typically it’s pretty rare save for a few orcs. But when I want to showcase a “big bad” with my kids, I go for Fisher Price’s Imaginext series! Dinosaurs and dragons, super villains and robots, these amazing toys may not always be to scale during our sessions, but they certainly make an impression on the battle-mat. 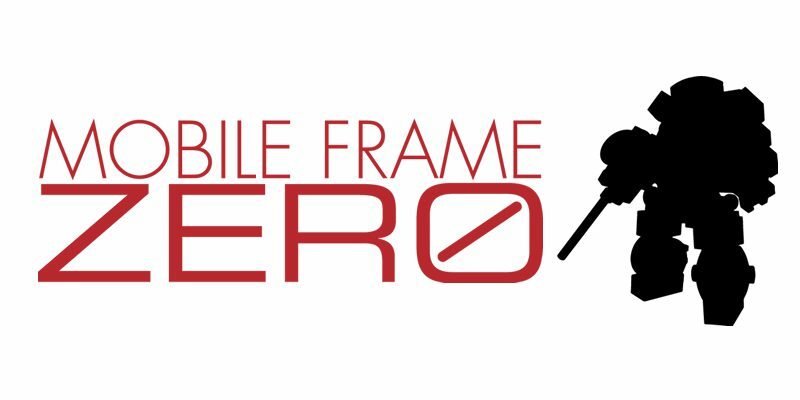 They are also incredibly durable, given the fact that they are designed for rigorous play. Knocking over one of these behemoths doesn’t condemn a gamer to an evening of superglue and touchup paint! 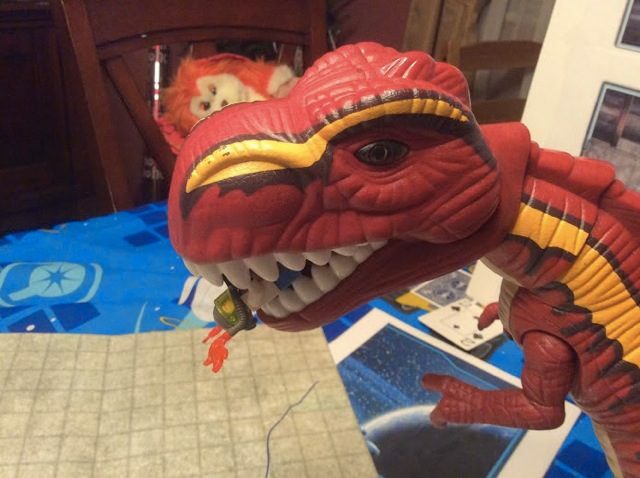 In a recent game of Savage Worlds – The Last Parsec I summoned the biggest Imaginext creature that we owned: a humongous and terrifying T-Rex! The screams from the kids were just amazing, and having such a massive creature on the table, ready to gobble up my daughters’ figures, really created a sense of tension. When one of the characters got chewed on by the T-Rex, I was able to place my daughters’ figure in its mouth until it was her turn. Not only was I telling her that her character was at risk, she got to see it right there at the table. The scene was so memorable that she continued to share the tale with friends and family through the holidays. Maybe you don’t have a large Lego collection, or perhaps you have no interest in purchasing seventy-five dollars in Imaginext toys since your kids are a bit older. A cheaper option is to just create the miniatures yourself! Actually, this gives you a fantastic opportunity to get your kids involved at the table even before you start playing. Don’t be afraid to experiment; just give them a little direction and go wild. 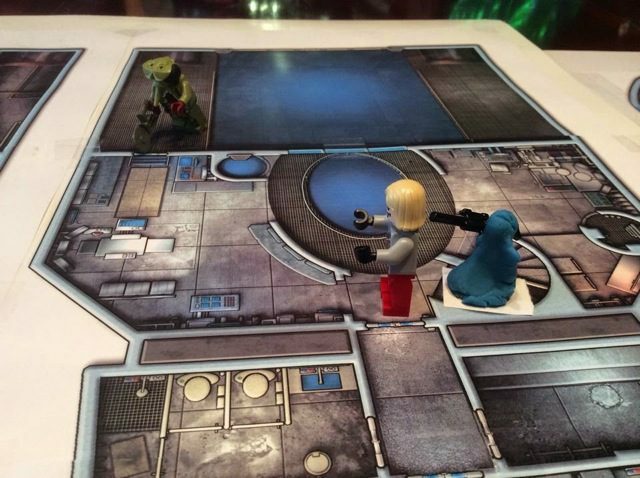 When they see that you are using something they created for a scene, it’ll help generate buy-in for role-playing games, especially from the younger players who are still learning why these kinds of games are so fun. 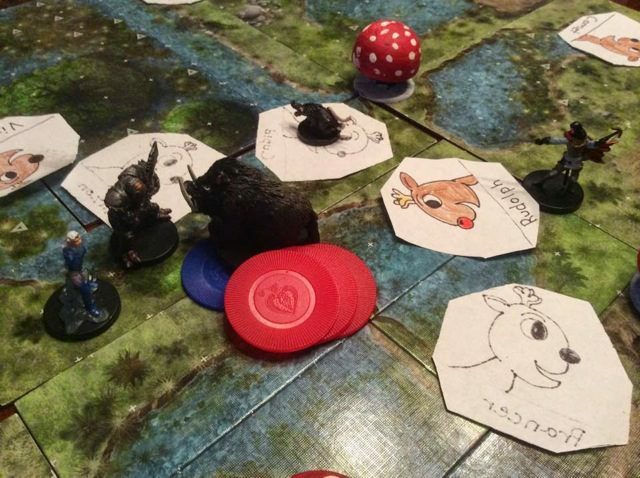 We’ve used paper figures for several of our games, from the War-Moths my daughters made in Numenera to our most recent Santa Gaming sessions over the holidays with those dreaded Wereindeer. To represent a gang of criminal blue blobs we turned to Play-Doh. While the soft substance may not hold up to larger creations you can easily craft creatures such as drakes, worms, or even spiders. My only advice would be to place these creatures on pieces of white paper before laying them down on your battle-mat. So go crazy! Feel free to mix and match some of these ideas, or come up with your own. If you find something here that was insightful or intriguing please share your thoughts and ideas in the comments below. 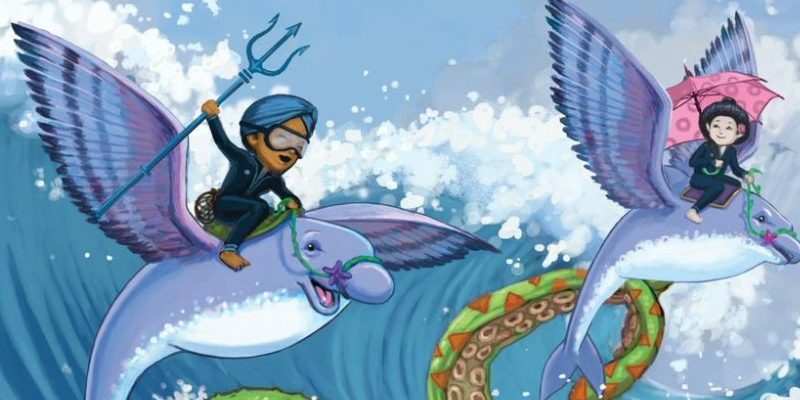 If you’ve already been using toys and crafts for miniatures, we’d love to hear your experiences and recommendations.